Home » General » Pre-reading Exercise. By Mr. Mogg in General on February 26, 2013 . 1. Because it is fair and right that those who must obey the laws should have a voice in making them, and that those who must pay taxes should have a vote as to the size of the tax and the way it shall be spent. 2. Because the moral, educational, and humane legislation desired by women would be got more easily if women had votes. New York women have worked in vain for years to secure a legislative appropriation to found a state industrial School for Girls. Colorado women worked in vain for one till they got the ballot; then the Legislature promptly granted it. 3. Because laws unjust to women would be amended more quickly. It cost Massachusetts women 55 years of effort to secure the law making mothers equal guardians of their children with the fathers. In Colorado, after women were enfranchised, the very next Legislature granted it. After more than half a century of agitation by women for this reform only 13 out of 46 States now give equal guardianship to mothers. 7. Because it would increase the moral and law-abiding vote very much, while increasing the vicious and criminal vote very little. The U. S. Census of 1890 gives the statistics of men and women in the state prisons of the different States. Omitting fractions, they are as follows: In the District of Columbia, women constitute 17 per cent. of the prisoners; in Massachusetts and Rhode Island, 14 per cent. ; in New York, 13; in Louisiana, 12; in Virginia, 11; in New Jersey, 10; in Pennsylvania and Maryland, 9; in Connecticut, 8; in Alabama, New Hampshire, Ohio and South Carolina, 7; in Florida, Maine, Mississippi, New Mexico and Tennessee, 6; in Georgia, Illinois, Indiana, Kentucky, Michigan, Missouri, North Carolina and West Virginia, 5; in Arkansas and Delaware, 4; in California, Minnesota, North Dakota, Texas and Vermont, 3; in Colorado, Iowa, Montana, Nebraska and Utah, 2; in Arizona, Kansas, Nevada and South Dakota, 1; in Washington, four-fifths of 1 per cent. ; in Oregon and Wisconsin, two-fifths of 1 percent; in Wyoming and Idaho, none. 10. Because it is the quietest, easiest, most dignified and least conspicuous way of influencing public affairs. I takes much less expenditure of time, labor and personal presence to go up to the ballot box, drop in a slip of paper, and then come away, than to persuade a multitude of miscellaneous voters to vote right. 12. Because woman’s ballot will make it hard for the notoriously bad candidates to be nominated or elected. 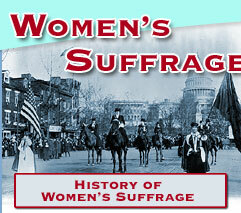 In the equal suffrage states, both parties have to put men of respectable character or lose the women’s vote. 13. Because it would increase women’s influence Mrs. Mary C. C. Bradford, president of the Colorado State Federation of Women’s clubs, said at the National Suffrage Convention in Washington in February: “Instead of woman’s influence being lessened by the ballot, it is greatly increased. Last year there were so many members of the legislature with bills which they wanted the club women to indorse that the Social Science department of the State Federation had to sit one day each week to confer with these legislators who were seeking our endorsement. Club women outside the suffrage states do not have this experience. 15. Because it is a maxim in war. “Always do the thing to which your adversary particularly objects.” Every vicious interest in the country would rather continue to contend with woman’s indirect influence than try to cope with woman’s vote. Because women already have the municipal vote, and are eligible for membership of most local authorities. These bodies deal with questions of housing, education, care of children, workhouses and so forth, all of which are peculiarly within a woman’s sphere. Parliament, however, has to deal mainly with the administration of a vast Empire, the maintenance of the Army and Navy, and with questions of peace and war, which lie outside the legitimate sphere of woman’s influence. Because all government rests ultimately on force, to which women, owing to physical, moral and social reasons, are not capable of con­tributing. Because women are not capable of full citizenship, for the simple reason that they are not available for purposes of national and Imperial defence. All government rests ultimately on force, to which women, owing to physical, moral and social reasons, are not capable of contributing. Because there is little doubt that the vast majority of women have no desire for the vote. Because the acquirement of the Parliamentary vote would logically involve admission to Parliament itself, and to all Government offices. It is scarcely possible to imagine a woman being Minister for War, and yet the principles of the Suffragettes involve that and many similar absurdities. Because the United Kingdom is not an isolated state, but the administrative and governing centre of a system of colonies and also of dependencies. The effect of introducing a large female ele­ment into the Imperial electorate would undoubtedly be to weaken the centre of power in the eyes of these dependent millions. Because past legislation in Parliament shows that the interests of women are perfectly safe in the hands of men. Because Woman Suffrage is based on the idea of the equality of the sexes, and tends to establish those competitive relations which will destroy chivalrous consideration. Because women have at present a vast indirect influence through their menfolk on the politics of this country. Because the physical nature of women unfits them for direct com­petition with men.